This is my kind of puzzle. Appropriately not-too-hard for a Wednesday with a funny wordplay-based theme. It’s a sound-alike theme focused on food. 16a [“Don’t worry about my cheesy chip”?] is ITS NACHO PROBLEM (it’s not your problem). 24a [“We should discuss your Qdoba order”?] is LETS TACO BOUT IT (let’s talk about it). 42a [“Should we settle this dispute over toppings outside?”] YA WANNA PIZZA ME? (you want a piece of me?). 55a [“That Italian dessert truly boggles the mind”?] I CANNOLI IMAGINE (I can only imagine). The only problem with this theme is that it made me hungry. The base phrases are all solidly in the language, the foods all fit pretty well, and each one made me grin. 1a [All that ___] JAZZ now has the song running through my head. I’m gonna rouge my knees and roll my stockings down…. 5a [Balkan native] is one of those clues that makes me put in the S and then check the crossings. This time it was SLAV, not Serb. 6d [Where to be among the Hmong] is LAOS. If you don’t know the history of the US exploitation of the Hmong during the Vietnam War, you should. After the fall of Saigon, the US government accepted Hmong refugees and resettled them in various towns across the country, including Fresno, CA. The resulting cultural collision is described in “The Spirit Catches You and You Fall Down” by Anne Fadiman. The book tells the story of a Hmong child with a seizure disorder, and the disastrous intersection of Hmong culture and American medicine. I read the book when it was published 20 years ago and it changed my approach to – everything. Are ARTSY people always [Culturally pretentious], or just in crosswords? Maybe that’s the difference between ARTSY and artistic. 48d [Common sights at pants knees] are RIPS. My kid buys her jeans with the rips pre-installed. What I didn’t know before I did this puzzle: I’d never heard of ALTOcumulus clouds. I shouldn’t be the only one with the song in my head. Well, apparently Zhouqin’s been keeping a LIST of your 2017 accomplishments and you’ve been very naughty. Today she gives you your comeuppance. “SHAME ON YOU!” she says at 61a [“That wasn’t nice!” and a hint to a trigram hidden in the asterisked answers]. What do we find in those answers? TSK TSK TSK TSK. I noticed the repeated SK in each answer during the solve, but it wasn’t until I got down to the revealer that the light bulb came on. And when it did, I thought it was a cute theme. 28a [Face throwing a kiss, e.g.]. EMOJI. Without any context, that’s a crazy clue. Until it makes sense. 64a [Pentagon figure]. AREA. You wanted someone from the armed forces, didn’t you? Well, the answer calls for mathematics, not the military. Tricksy. 66a [High Sierra runner]. IMAC. Another good bit of deception. At first glance, this sounds like some sort of flightless bird in the California mountains. Nope, it’s the latest Mac operating system. Come on, keep up! 67a [Market aid]. LIST. Ha! Again, being the WSJ, you’d think this had to do with the stock market. Nope. Just a shopping LIST. And by the way, it still amazes me that I see people in stores with hand-written lists. Isn’t this what smartphones were created for? 2d [Robin’s home]. GOTHAM. Not the bird, but Batman’s buddy. 6d [Potato pancakes]. LATKES. If you didn’t know this, watch the video below. 12d [Creature on Gothic tapestries]. UNICORN. 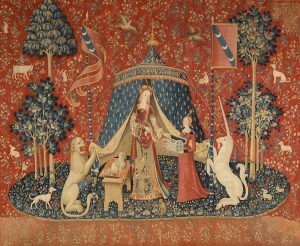 This clue reminded me of my bedroom where you’d find one such Gothic tapestry. Because a man’s home is his wife’s castle. 57d [It can be cured]. MEAT. Ha! Not an affliction, but food (for some). And well, maybe an affliction for others. Cute theme, good fill, fun cluing. Good puzzle overall. And Zhouqin, we will all try to do better this year. I loved the vertical stack down the middle – IPHONE CASE, CLICKHOLE, and SWISS ROLLS are all lovely relatively modern fill. Today’s MOVINGVAN theme cuts a diagonal swathe through the grid. The entries themselves: VANDALIZE, HAVANACIGAR, TAKEADVANTAGEOF and MANSERVANTS were a touch on the bland side though. The opposite diagonal played more like a themeless, with big corners and long non-theme answers like PANTOMIMED and PETERLORRE. I found I enjoyed solving the non-thematic corners more! BEANO as clued means nothing to me, but if clued as the home of Dennis the Menace (the proper one)… Weirdest (but inferrable) word: MENTEE. This entry was posted in Daily Puzzles and tagged Bruce Haight, C.C. Burnikel, Ed Sessa, Paolo Pasco, Zhouqin Burnikel. Bookmark the permalink. I agree with everything Jenni said, including learning about ALTO cumuli. I remember many Hmongs in Oakland also, mostly women and children. wsj 37a – ALL SKIN TONES ARE SUSCEPTIBLE TO SUNBURN. PLENTY of cluing options here that don’t say “hey dark-skinned folks, don’t worry about using sunscreen, you’re good!” i’m only yelling because y’all’s editors didn’t hear me the first 6 times this came up. As Chris “The Prat without a Hat” Lewis discovered: http://www.espncricinfo.com/magazine/content/story/381830.html . You should look up what “susceptible” means. Clue accurate. nowhere did i impugn the accuracy of the clue. i’m very sceptible that you fully understand my critique. You are correct, of course. All skin tones are susceptible to sunburn. The degree of susceptibility may vary but that’s not what the clue says, ergo the clue is wrong, and wrong in a way that contributes to othering dark-skinned folk. Uncool. Susceptibility of one group does not mean the others are immune. You’re wrong, and you know you’re wrong. And of course the clue “others” black people. The answer is LIGHTSKIN, not DARKSKIN. If the answer was APPLE, you don’t need to discuss ORANGE, CHERRY, POMEGRANATE…. No, you’re wrong. If you clued APPLE as [Kind of fruit that is susceptible to rotting], it would be a crappy clue because the clue is far too broad to point at the answer. Cherries, oranges, and pomegranates rot, too. And the LIGHT SKIN clue is worse, because it promulgates the misconception that people with darker skin don’t need to worry about skin protection. The estimated 5-year melanoma survival rate for blacks is only 69%, versus 93% for whites. You think it might have something to do with the cancer not being caught early, because too many people think that dark-skinned people don’t have to worry about skin cancer? The NYT puns were fabulously terrible. Still laughing. Go, Mr. Haight! It’s free, it’s clever, it’s funny! Terrific NYT. Nicely Scrabbly, too. NYT: I’m not a pun person and I loved it. It made me chuckle every time and I did it in Tuesday time. Can you believe there are eight (8) ratings of “1” for Bruce’s NYT? The rating system is broken and primarily a place for the malcontents to try to feel better about their own life. Never once have I received a response from someone who issued a 1 rating to explain why. Perhaps I don’t get out much, but I’ve never heard “It’s nacho problem” before. Good puns are in the eye (or ear) of the beholder, and I liked these – maybe because they remind me of my father. I think the lowest rating I have given to a puzzle is 1.5 stars. That being said, I can see someone giving this one a 1-star. My rating was 2.5. I think the theme was not executed properly. If only the cluing acknowledged how horrible the puns were in tone. I also don’t like puzzles filled with 3-4 letter words (65.7%! ), so I’m inherently biased. You both make my point. For a puzzle to justify a “1” rating it would need to be abysmal. Puns are always tricky to judge as the reaction is very much in the eyes (and ears) of the beholder. Biased and disapproving, but a “1”? If the puns are abysmal in the opinion of the beholder, then why is a 1 rating not warranted? It’s fine for you to speak up in defense of the puzzle, but it is also legitimate for others to have found it really, really bad. I gave it a 2 and will happily explain why. I didn’t hate it as much as Rex (though I correctly predicted that he would excoriate it) but the puns just made me roll my eyes and I didn’t enjoy the fill. In my personal rating system, like yours, a puzzle would have to be abysmal to get a rating of 1, but I could imagine someone just using a 1 to indicate that the puzzle fell in the lowest quintile of the crosswords that this blog covers. I too gave it a 2. I savor puns as much as anyone, but these all seemed tortured to me and the puzzle consequently didn’t float my proverbial boat. There have been other days where I personally enjoyed and gave a high rating to puzzles that got badly panned by others here. Guess it all evens out. I’m probably fighting a losing battle here, but I wish people would stop treating the ratings as though they’re a meaningful metric altogether. Ask 50 different people their opinions on the same puzzle, and they’ll give you 50 different opinions. So it goes. Not truth, an opinion. One I disagree with. The star system is far from meaninglessness and far from being an ineffectual barometer. I mean, what’s it inferior to? That other ratings system? Fifty-plus people registered as many opinions today, and the barometer reads Medium, a reasonable representation, dare I say metric, of the puzzle’s quality. And, generally speaking, when a puzzle is really bad the Barometer reads Low and when a puzzle is outstanding the star system, much more often than not, reflects that it is outstanding. To casually dismiss the enterprise on the grounds that subjectivity exists seems either snobbish or Conservatively naive: measuring aggregate pathos is not solely the province of academia and such; there is much value and informativeness in just letting people talk and register their opinions and while the data recorded from doing so may not hold up in court or look good under a microscope, it can still lead to sound speculation and conclusions. And often it does. Dig casual science. I would similarly defend the Imdb rating system. Offhand, it’s tempting to disregard it as frivolous, as something far from a meaningful metric, for self-evident reasons such as how easy it is to abuse it, or that laymen viewers aren’t professional critics. Nonetheless, the Imdb rating is my go-to for ascertaining movie and series quality. And it rarely fails me: movies I will hate or be bored by are 6 or lower; good movies are around 7; great, 8; extraordinary, around 9. And I’m grateful to all those raters that post their opinions there, and I’m glad they didn’t refrain from doing so because they let someone convince them that doing so wasn’t worthwhile. And I commend all the people who take the time to thumbs-up and -down the puzzles here. One virtue of dong so is provision of the excellent Tool for New Constructors of being able to scour the archives here and study the puzzles that got really high and really low ratings. It’s a great way to efficiently grasp a modern consensus of what constitutes inferior and superior puzzlemaking. Here’s why I don’t think the rating system is a meaningful metric for determining what’s a good puzzle and what isn’t. 1. There’s no actual defined criteria for how to differentiate between, say, 3 stars, 3.5 stars, 4 stars, etc., or even in-between ratings that some reviewers might use like 4.2 stars or 4.3 stars. Like IMDB, it’s just based on whatever the rater *feels* like it is, and I’m not going to just accept based on pure numbers that a puzzle with a 4.0 average rating is objectively better than a puzzle with a 3.5 average. There have been many puzzles with average ratings above 4 stars that I didn’t enjoy solving, and many puzzles in the high 2’s or low 3’s that I enjoyed a whole bunch — just as there are movies that rate in the 8’s on IMDB that I might think aren’t very good where others in the high 6’s I might think are quite good. “Rise of the Planet of the Apes” has a 7.6 rating, and my brother and I both thought it was total crap. 2. 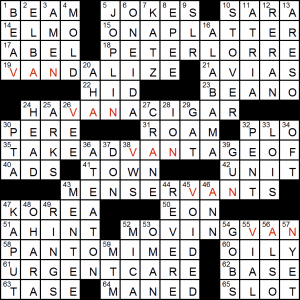 Many things go into the experience of solving a crossword: The theme (if it has one), the fill, the difficulty, the accuracy and cleverness of the clues, the length of the clues, how many proper nouns there are (and what you or another solver might consider well-known or obscure trivia), whether any clues convey objectifying or hurtful meanings, and probably many other factors — all for just one puzzle. And many solvers (perhaps most) rate puzzles on completely different things, prioritizing some criteria while ignoring others. Some will give a puzzle 5 stars simply if they like the theme, without considering the rest of the fill. Some put a higher premium on the fill; just about everyone who comments here has a different idea about what’s good fill, what’s acceptable, and what isn’t. Some might otherwise love a puzzle but slam it in the ratings because one clue or answer made them cringe, where others may not care about that one clue or answer at all. 3. The ratings are *largely* biased towards tricky, Thursday-level puzzles (and metas), and I suspect that’s because many people who bother to rate puzzles here are veteran solvers. I would strongly hope that new constructors don’t use the ratings as a tool for judging what’s a good puzzle for this reason since they might conclude that “superior” puzzle-making is simply a function of the puzzle’s relative difficulty. I love uncovering a novel theme trick in a NYT Thursday or a Fireball or a MGWCC puzzle as much as anyone, but there’s no reason that such a puzzle is inherently better than an easy, early-week puzzle. 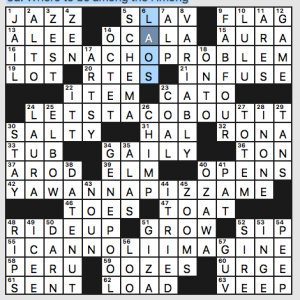 Again, there are many factors that go into solving a crossword, and your experience of solving it may be very different from mine or someone else’s. 4. Related to #3, I recall that some commenters have admitted that they never rate Monday NYT puzzles higher than 3 or (at best) 4 stars. Why is that? Because they’re relatively easy? 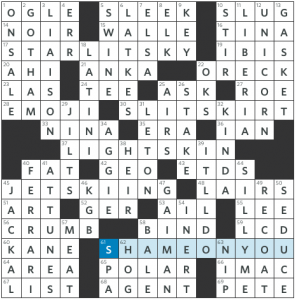 Why can’t a Monday NYT puzzle with a clever theme and well-executed fill be a 5-star-worthy puzzle for what it is? The fact that some veteran solvers have apparently decided that Monday NYT puzzles cannot rate above 3 or 4 stars on a 5-star scale introduces its own level of bias that a neutral observer might not notice. 5. Regardless of how I felt about the Jan. 3 NYT puzzle, and though I don’t necessarily agree with everything lemonade714 wrote, there is a valid complaint there: People who leave 1-star ratings rarely explain why they did and, in many cases, don’t articulate how the puzzle could have been improved. I fail to see how that’s supposed to teach new constructors about what makes a good puzzle. 6. And that’s all before we get to small sample sizes for almost all puzzles reviewed here not named the NYT or MGWCC. At least with IMDB you get tens of thousands of ratings for a single movie; you could even make do just by selecting a cross-section of a few hundred IMDB ratings. But some puzzles, like the CRooked Crossword, often get fewer than 10 ratings; are we supposed to draw any ratings-based conclusions about that puzzle, and how it compares to others, when only 10 people (if that) submit a number? And even if the sample sizes were larger, how would they be useful when nearly everyone judges the puzzles using different, subjective criteria? If you or others want to keep rating the puzzles here, go ahead; I used to rate them myself. But the fact that I no longer treat the Fiend ratings as a useful metric is neither “snobbish” nor “conservatively naive.” It’s just my way of registering what I think they represent: a flawed method of objectively measuring the quality of something that is mostly, or perhaps entirely, a subjective experience. The less time that constructors (both new ones and veterans) spend worrying about the ratings, the better. Just a reminder that IMDb requires five ratings to post results. I’m not saying to do that here; the more info the better, as far as I’m concerned, even if one has to be wary. Hi from the American Express lounge at Sea-Tac. Heading home after two weeks, mostly cooking and eating. Is “Claudia (Lady Bird) Johnson the name in the movie too? I assumed that it referred to the wife of Lyndon Baines Johnson. Yep, 1A is talking about the First Lady. The movie character’s name is Christine McPherson. I’m shocked at how many low ratings this puzzle has gotten. We’re only three days into the year, and I already expect this to be a 2018 Orca contender. I looooooved Paolo’s puzzle! I don’t always do the AV Club puzzle each week, but when that email popped up last night with Paolo’s name and the magic word “themeless,” I pounced on it. It did not disappoint. It even copied VANDALIZE and TAKEADVANTAGEOF. When including the revealer (MOVINGVAN), that’s 3 of the 5 theme words being directly copied!! I’m not quite sure how LAT could have even accepted this one… Very underwhelmed (and even disappointed) by the LAT today. Perhaps you should direct those comments to Rich Norris and his staff. Wow, that is quite a striking similarity. The WSJ puzzle ran just over five months ago. It takes at least three, three and a half months these days to hear back from Rich Norris regarding acceptance. And I’ve never had one of my puzzles run less than six months after being accepted. So hopefully this is just a coincidence? See Ed Sessa’s reply below, outside of this thread. Re: Paolo Pasco’s AVCX Tough, but doable and informative for a tyro like myself. As a side, i found that a protege of Dolly, Miley CAN do some really good stuff with her take on Jolene – check it out! I would not normally respond to comments published in this blog site, but with respect to the statement by “anon” about today’s LAT being “directly copied,” etc. I feel it fair to set the record straight. Because I had a title for this puzzle it was originally sent to the WSJ. Mike Shenk turned it down because as he wrote he had already accepted one similar to it, which had not even been published yet. So a decision had to be made – the concept came independently to me and WAS NOT “COPIED”, and would be submitted to the LAT BEFORE the WSJ puzzle was even published, and if accepted would be done by solvers who probably don’t do multiple puzzles in different venues. So I felt in good conscience I could try to market this puzzle. Like others I am sure, I have solved puzzles in the past that seemed similar to ones done already without feeling the need to impugn the integrity of the constructors. I do not copy the work or ideas of others, and take issue with mean-spirited way “anon” phrased his or her commentary. Quite so, Ed—variations on familiar themes are often thought up independently by constructors. And while the readers of this blog are probably far more likely to be chasing down puzzles from disparate venues, a great many solvers are just doing the one in the newspaper they get. If you told Rich Norris that it was similar to an upcoming WSJ puzzle that you hadn’t seen, I can’t imagine he would use that as a reason to reject a puzzle that otherwise passes muster for the LAT. We’ve seen many other riffs on familiar themes, with plenty of overlap in theme answers. These things happen (and most of the time aren’t plagiarism at all). I completely understand your predicament. I suppose “copied” is the wrong phrasing. I understand the possibility and likelihood of theme overlap over different publications (and over a few months), especially when editors respond months later. My frustration should have been directed more toward the editor than the constructor. As a puzzle constructor myself, I have experienced the same kind of delays, during which puzzles of similar themes have come along, discrediting my own puzzle and theme. I hope you understand where I’m coming from. I did not mean to attack you personally and I apologize for coming off that way. The puzzle itself is solid and I give a lot of credit to anyone who can construct puzzles in the first place. anon, why would you aim frustration at Rich for accepting a puzzle that works for his venue, or at Mike for rightly turning down a puzzle too similar to one already in the pipeline? If you think that all of us crossword editors are solving all of the other puzzles out there on a daily basis and remembering all the themes … um, NO. We really don’t do that. Been in the islands for a week. 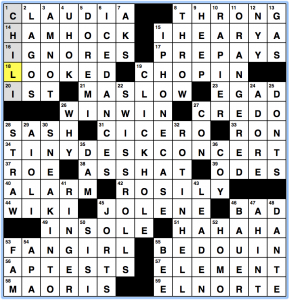 Decided to retire my scowl-o-meter as it relates to crosswords. Happy 2018 everybody! Love you lots! Cute NYT puzzle. Thanks for the write-up , Jenni! I’ve also read the Anne Fadiman book that you mentioned and liked it a lot. She also has a wonderful book of essays called Ex Libris: Confessions of a Common Reader – highly recommended. In the LAT, the plural of manservant should be manservants, not menservants. Gareth has it correct in his write-up, but it’s wrong in the puzzle.